As North Carolina’s only accredited Caregiver registry, CaregiverNC meets the highest standards in private-duty Caregiver referrals. We give consumers the ability to choose the Caregiver that they believe is the best fit to provide the care they require. CaregiverNC has a proven process for screening and credentialing all Caregivers so that Care Seekers can feel confident in their choices. Through our match technology, Caregivers and Care Seekers can determine compatibility of needs prior to making contact. For more information Contact Us today! The first step of joining CaregiverNC is to create a profile. In addition to your basic information, your profile will showcase your skills, experience and education as a Caregiver. There is also a field where you may enter any certifications, education or licenses that pertain to your business as a Caregiver. All information submitted to CaregiverNC will be reviewed, so please ensure their validity. You will also have the opportunity to enter the distance you are willing to travel to provide care and specific services you offer. This includes entering which tasks that you are willing or unwilling to do for Care Seekers. With the information you’ve submitted, CaregiverNC’s matching database filters through the profiles of Care Seekers and finds potential matches that fit your specific skill set. From there, you may inquire about available caregiver requests or wait to be contacted by a potential Care Seeker. Once you have connected with a Care Seeker, you can discuss details of the opportunity and provide any additional information they might request for elderly care and home care assistance. You will determine matters of scheduling and rate of pay directly with the Care Seeker. Join CaregiverNC today to find Caregiver referral opportunities in your area. To join CaregiverNC, you will first create a profile. In addition to your basic information, your profile will show the services you are looking for and information about the qualities and skills you need your Caregiver to have. Being as specific as possible is important to helping our Caregiver registry’s matching database pair you accurately with potential Caregivers. Once your profile is complete, CaregiverNC’s matching database filters the profiles of Caregivers. The database produces a list of Caregivers close to you who best match your needs and requirements and allows you to choose which home care professional you’d like to work with. These Caregiver profiles are available for you to view so you can be sure the professional you choose will fit well into your daily life and home. You may directly contact any caregivers that fit your requirements to discuss schedules and rate of pay. Care seekers looking for full-service support can upgrade to premium services for additional support. Join CaregiverNC today to find the perfect home care professional for your needs. How Do We Match Caregivers and Care Seekers? Our online matching system uses the profile information provided by each Caregiver and Care Seeker to build a list of potential matches. These lists are ranked based on the percentage of criteria found to be matching on both Caregiver and Care Seeker profiles and the geographic location of the Caregiver and the Care Seeker. Caregivers listed on our registry have the option of upgrading to our premium Caregiver package, which offers a range of marketing benefits. Become a PREMIUM Caregiver Now! Membership options will become available when account is approved. 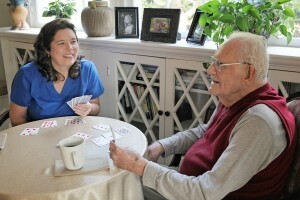 Care Seekers can choose to take advantage of our Care Concierge Program, offered in partnership with AOS At Home Care. With a Care Concierge, Care Seekers have access to a full range of personalized support.